Cloud hosting is a web hosting service delivered from a group of connected servers. The term cloud hosting (also called clustered hosting) is not precisely defined yet. In general, however, a hosting service can be considered cloud hosting when it is delivered from a fully redundant, multi-server system, in which the resources are dynamically scalable and often virtualized. In less technical terminology, cloud hosting uses a number of servers all connected together (a cloud), and sites on the servers can use resources from all the servers in that cloud. Processing power, hard drives, and memory are shared. Servers can be easily added or removed as necessary, and if one server is down, sites use resources from other servers instead. A cloud hosting service is usually delivered from a load-balanced cluster server platform, while the data is stored in a SAN (Storage Area Network). Cloud hosting providers measure compute cycles, an indicator which measures how much processing time applications require. This enables cloud hosting to be provided and billed as a part of a different service model than that used by other web hosting services. Clients pay for actual resources needed. 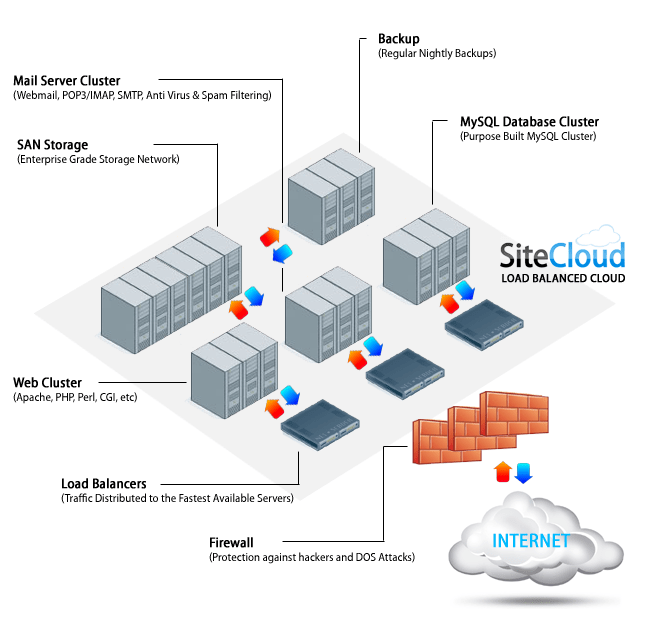 SiteCloud is currently offering cloud based hosting at a very affordable price, from $5.95/month. Click here for details.